I certainly hope so! I’m a super funny, smart and driven Mama, entrepreneur and fitness professional looking to teach, educate and promote goods, services and events I love. In particular, I’d love to support you if you have something that helps or inspires the lives of busy Mamas striving to be healthy life role models for their families. Fitness, Nutrition & Health Products: I love getting my hands on and trying out fitness equipment, technology and apparel. I want to make getting fit and healthy interesting, more accessible, easier and more fun for busy families. If you have something that helps me get a nation moving, I’m in! Fitness Events: If you have an event that gets people active, or even better, if you have an event that gets entire families moving, I want to be involved. I want to support you and reach more families to help get more people out, active and having fun. Motherhood: We all know how difficult and trying motherhood can be, so if you have something that’s going to make my life and the lives of other mothers easier, I’m all ears. And I’m all talk. If you have a product, service or event for mothers with babies, toddlers or teens, I want to know about it, try it out and when I fall madly in love with it, promote it like crazy for you. Better yet, get me involved to educate and inspire! Business: As a busy Mom with a thriving and successful business I started out of my garage, I am always looking for way to organize, motivate and inspire myself to keep moving, keep pushing. My life is full of stress, so if you have a way to decrease and/or help me manage that world, I’d love to support and encourage you. I’d love to help you get the word out about the amazing help your products and/or services can provide. Conferences & Workshops: One of my favorite jobs is to educate groups of people on all things motherhood, entrepreneurial and health and fitness-related. Put me in front of a group of parents, kids, teens (whatever you’ve got) and let me motivate and inspire them to move their bodies, eat good food, get sleep, BE HEALTHY. I’m smart, silly, a little quirky and relatable. Workshops of core training, pre/post-natal fitness, the importance of healthy role models. And so much more…honestly…I could talk for DAYS on most anything fitness and family-related. Online Services: We all know where people shop and look for new information, so let’s work together to get your products, services and/or events out there to the masses. 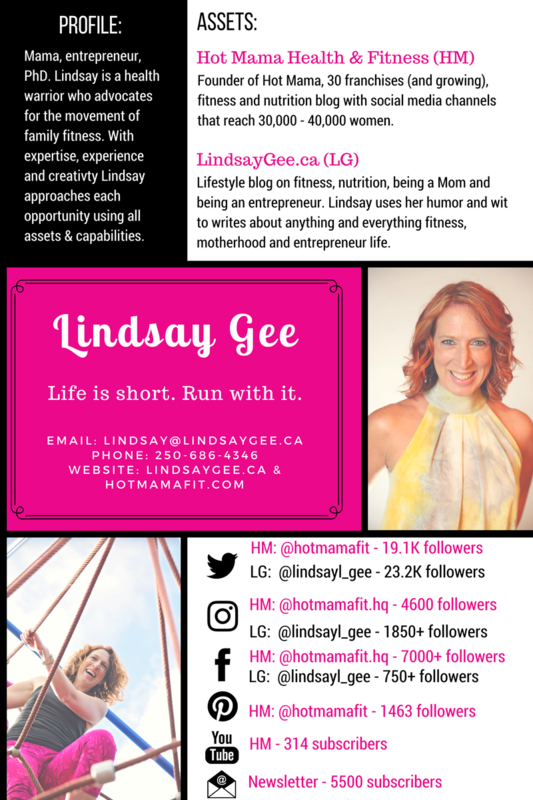 Lindsaygee.ca may be a new website, but me, I’m not new to the fitness, motherhood or entrepreneurial world. So, let’s connect and work together! Please email me at lindsay@lindsaygee.ca and let’s get started! Click HERE to access my media kit.